Email remains a highly effective way to generate sales. According to one industry analyst, 90% of marketers say email is their primary tool for creating awareness and reaching customers. For restaurants and wineries, email marketing is the single most cost-effective way to keep in touch with your customers. Restaurants can use an email newsletter to stay top of mind with regular customers, share recipes from the chef, or provide an exclusive behind-the-scenes view of the business. Email marketing is a good way to announce seasonal specials or menu changes, and it gives you a way to appeal to less frequent customers with coupons or timely reminders. 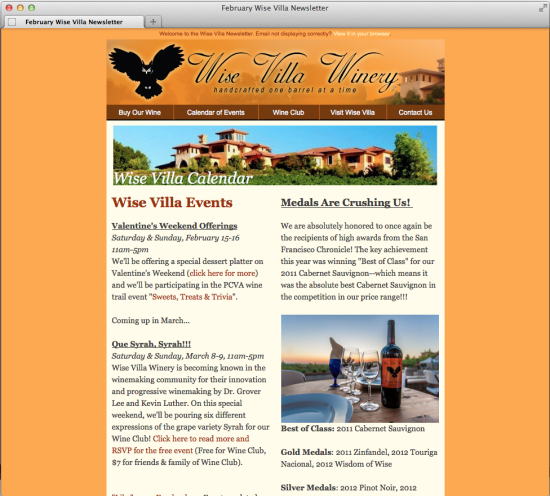 For wineries, email marketing is an important part of maintaining an active wine club. Email is your primary form of communication to club members, and it offers you a unique channel for direct-to-consumer sales. An email newsletter allows you to promote exclusive winery events, announce new releases, promote regional events such as winemaker dinners, and offer additional services such as weddings and private events. How can we improve your email marketing? Ready to use email marketing to increase sales or reservations?